Botanically, pea plant is a herbaceous vine. It belongs to the family of Fabaceae, in the genus: Pisum. Scientific name: Pisum sativum. Some of the common names include English peas, spring peas, sweet peas, garden peas, pease,...etc. Green pea. Note for bright green pod encasing round light green color edible peas. Garden pea vine with pods. Garden peas are also good in vitamin-K. 100 g of fresh seeds contain about 24.8 µg or about 21% of daily requirement of vitamin K-1 (phylloquinone). Vitamin-K has been found to have a potential role in bone mass building function (mineralization) through the promotion of osteoblastic activity inside the bone cells. It also has an established role in the cure of Alzheimer's disease patients by limiting neuronal damage in the brain. Fresh green peas in a market. Green peas are winter crops. 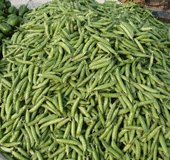 Fresh peas can be readily available from December until April in the markets. However, dry, mature seeds, and split peas, flour...etc., can be found in the markets around the year. Green peas sauteed with oil. garlic, onion. Green peas, known as mutter, are one of the common ingredients in winter season dishes in the Indian-subcontinent. Fresh peas added to a variety of mouth-watering recipes like Aaloo-mutter, mutter-paneer, mutter-gajjar...etc with added spices, garlic, coriander leaves, onions, and tomato. <<-Back to Vegetables from Green peas. Visit here for an impressive list of vegetables with complete illustrations of their nutrition facts and health benefits. Pisum sativum University of Maryland Extension. (pdf-Link opens in new window).